If you’ve ever been on a shoot, you know that between the generators, wind and rain machines, crowds of onlookers, and crew members scurrying around, even a quiet set hums with activity. On top of the noise you can control, there are all the noises you can’t: planes flying overhead, a garbage truck passing by, or the neighbor yelling at his kids. You’ve only got the location for a couple of hours, and that perfect quiet moment may never come. So you keep filming, hoping your production sound mixer is able to capture every line cleanly. But then you get the dailies and as you feared, a car horn blared right over your perfect take just as the actor delivered his line. It’s not the production sound mixer’s fault; that horn was loud! The take is ruined…or is it? ADR gives you back that moment—and in some cases can even improve it. ADR is the process of re-recording the set audio in a quieter, more controlled setting, typically at a recording studio. You may also hear ADR referred to as “looping,” a throwback to the old film days when the lines that needed to be replaced were cut into large physical loops of film and optical sound stock for repetitive picture playback. Noisy or unintelligible audio was recorded on set. Most directors prefer to avoid ADR if they can, but locations like Times Square, the beach, or a torrential rainstorm are inherently noisy. While they may look great on film, they’re terrible for audio recording. Should you decide to film in one of those places, you’d best be prepared to replace some (or all) of the audio recorded there. Replacing or adding lines to enhance the performance. Sometimes an actor’s line reading can be slightly off. Or perhaps the tenor of the scene has changed in the edit, so a line that sounded right on set just doesn’t work anymore. Or while you’re editing you feel like a scene is missing something; a well-timed breath or sigh could be exactly what you need to deepen the scene’s emotional impact. Accents. Often, actors must use various accents, which can result in the occasional lapse that needs fixing. There have even been cases when an off-putting accent has necessitated re-recording all of a character’s lines. In the film “Elysium,” for example, Jodie Foster’s original performance was done with a French accent. Test audiences responded negatively to it, so the studio decided to replace all of her lines with a more Americanized accent. She did a great job (of course—she’s Jodie Foster), but if you watch the film closely you may notice some minor sync issues because mouths move slightly differently with different accents. Fixing story or continuity errors. Unanticipated plot holes in your story can come up after production has wrapped, so ADR can be a useful tool to add a bit of extra exposition when needed. I’ve even seen cases where the production decided to rename a main character after the film was shot. TV/Airline versions. Some distributors will require alternate versions of a soundtrack without profanity or adult language. And depending on how many types of markets a film is being distributed to, several different versions may be required. Sound-alike for an unavailable actor. This doesn’t happen often, but in the off chance an actor isn’t available, or is unwilling to provide additional dialog, you might have to hire a sound-alike. ADR can seem like a magical fix to any sort of production issue, but recording good ADR is very challenging, and one of the toughest challenges is that you’re taking the actors into a completely different environment from what happened on set and asking them to repeat their previous performance without the rest of the cast to interact with. Meryl Streep is one of the rare actors who famously enjoys doing ADR. She’ll walk into a session for a few minor cues and end up replacing the dialog for entire scenes where she thinks she can do a better job. This scene from “Postcards from the Edge” is not too unlike what she’s able to do in real life. Another was Marlon Brando. According to the legendary editor Walter Murch (who worked as the ADR supervisor on “The Godfather”), Brando confessed to intentionally mumbling on set just so he could see the final edit and then try to improve his performance in the full context of the film. But when you don’t have the good fortune to work with an actor who’s quite that eager and agreeable, what then? No small feat, when you consider how much is involved in order to make the ADR undetectable when cut in with the production sound. As the film is nearing completion, the director and members of the sound team watch the film and discuss the soundtrack as a whole, making notes about production audio quality, dialog that needs to be added, and which lines need to be replaced. 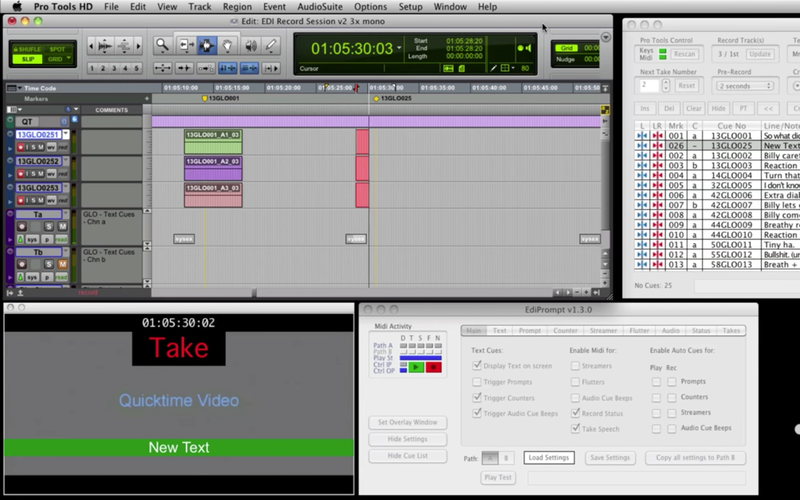 Once the dialog editor has gone through all of the production recordings and assesses their quality, he or she will compile a list of cues and add them to any cues from the director and producer. Once all of the dialog requirements have been established, the sound department will schedule the actors and send the ADR mixer a copy of the film, along with a written breakdown of the lines for each actor. On the day of the session, the actor arrives at the ADR stage, ideally along with the director and a member of the sound department. But when the film director and the ADR studio are in different cities, there’s even more to coordinate. First, the ADR mixer mics the actor with a boom and lavalier in front of a screen where the video will be projected. The ADR mixer plays the cue to be replaced, and the actor will carefully note the timing, pitch, and inflection. In the case of an added line, the director may add temp audio to the scratch track so the actor has a feel for the timing. After the line has been recorded, the ADR mixer plays it back in context with the rest of the scene. If everyone is happy with the recorded take, they move on to the next cue until all of the cues have been recorded. The ADR mixer and sound supervisor take detailed notes about which takes they like the best for each line. After the session, the ADR mixer sends the recorded audio to the ADR editor to be edited and mixed into the rest of the film’s soundtrack. If all has gone well, the ADR will be indistinguishable from the production audio. ProTools session with ADR cue. One of the keys to a good match between the production audio and the studio audio is to attempt to replicate the production audio conditions in the studio as closely as possible. 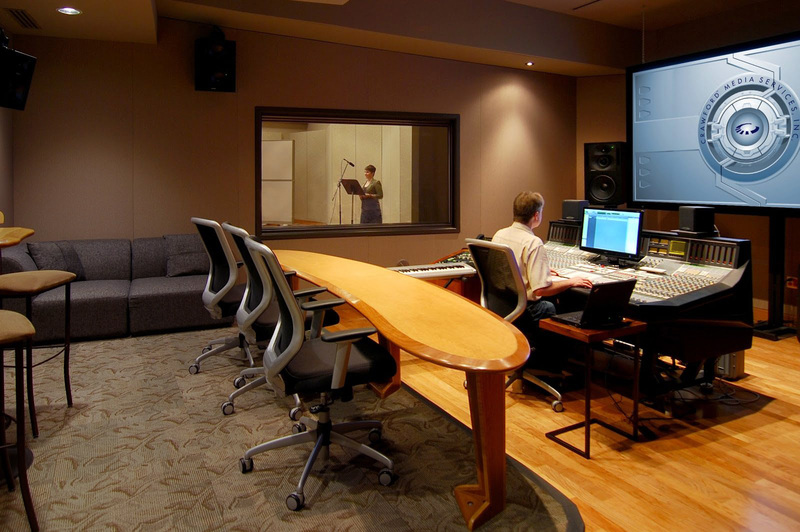 It’s key to consult with the production sound mixer and request that the ADR studio provides the same models of microphones that were used on set. The ADR mixer will approximate the distance and angle of the studio microphones to closely match the production setup. They’ll typically record two separate tracks: one for the boom microphone and one for the lavalier. This gives the sound department optimal flexibility when editing the takes and mixing them in with the production sound. Obviously, there are times when you have to get clever about how you recreate the circumstances, particularly if you’re filling in a crowd scene. Generally, you’ll need at least four actors to help fill in a dense scene with lots of extras, and record several passes. I once worked on a short film that took place in a restaurant. The scene started off on a positive note with two female characters exchanging pleasantries. As the scene progressed however, it became clear that the two characters shared a dark secret and were not the best friends they initially appeared to be. The film ended with the actors getting into a physical altercation. To help create an ever-increasing feeling of tension, the director and I devised a plan to record three pairs of actors in a studio to fill in the audio for the other patrons in the restaurant. We wanted three types of background tracks: one pleasant and benign, one slightly aggravated, and the last openly hostile. We had the pairs of actors improvise the three tracks and laid them into the mix. This allowed us to fill out the rest of the audio track to give us a sense of realism while amping up the tension by fading into the increasingly tension-filled takes. No detail is too small when it comes to matching the production audio. Early in my career when I was a studio assistant, I worked on Sam Raimi’s first Spider-man movie. A box arrived prior to the ADR session and in it was a pair of molded false teeth that J.K. Simmons had worn on set while filming. When he came in for the session the next day, he was able to flawlessly mimic the unique speech pattern the prosthetic had helped him achieve. Brando and Streep aside, ADR is incredibly difficult for many actors. While some actors may relish the opportunity to make their performance better, many do not—some may even consider the request to redo a line a criticism of their acting. That’s why it’s important to approach cautiously when replacing lines for anything other than technical reasons. That’s also why it’s so important to make the actor as comfortable as possible. Greg Crawford notes that when he’s had the advantage of working with an actor repeatedly, he knows what they like and can prepare for them, but that’s a luxury. “For the most part, I really only get to meet someone when they come up the elevator. We have a minute to chat and I try to get a feel for how they’re doing that day and pay attention to any specific requests, like if they want to hear a lot of the production audio in their headphones so they can basically talk over themselves.” Other actors prefer to mimic their performance by listening to the line once and then parroting several takes, which can be very effective but requires a little extra editing time on the back end. Getting the timing and pitch just right is essential because, as every actor knows, the slightest difference in the emphasis of a line can alter the scene’s meaning or feeling. This can be particularly challenging because you generally record ADR in small pieces, even if they fit together into a long monologue, and it takes great skill to record each piece of dialogue so that it sounds consistent with the rest of the sound that was recorded on set. Vocal pitch can often be higher on set than in a studio setting. Or, the actor may be returning to a project after a period of months, so they need to be re-familiarized with the scenes again. That’s why it’s also vital to play the entire scene for the actor to remind them of the context and to get them back into the mood of the performance. You’ve prepped the room, you’ve prepped the actor. Now you have to run the session, which means not only playing back and recording the material and getting the best audio match, but also managing the feedback from the director and from anyone else who happens to have input on the session. What comes into play now is figuring out the balance of how much input you have and how much directing your client wants to do—combined with the fact that they may not physically be present. Greg refers to this as “taking the temperature of the room.” The ADR engineer is functioning as a second set of hands for the clients who may be in other locations, such as LA, New York, London, or Paris. Knowing when to jump in with feedback or when to be quiet isn’t a skill that can be taught—it’s an instinct that’s acquired over years of working in the profession. And even with thirty years under his belt, Greg finds himself wondering if he’s overstepped on occasion. “I once worked with an actress for the first time and there was a scene in which she was supposed to be walking in the distance, and it just wasn’t sounding natural at all. So I suggested that maybe she should move her shoulders a little or swing her arms so that it would sound like she was moving and talking, rather than reading from a script. She’s listening and doing what I’m asking, but I’m noticing that it’s getting pretty quiet from the LA studio and they’re not chiming in much. And in my head, I’m thinking that it’s going well with her, but I’ll probably get yelled at after the session for taking over too much. Another common use of ADR is to add lines that weren’t originally recorded in production. It’s tricky knowing where and how best to place a new line. After all, you don’t want your film to look and sound like a badly dubbed monster movie. Tacking a few extra seconds onto a cutaway during the edit can be helpful, allowing you to insert a line explaining a crucial plot point. Look for places to continue a previously spoken sentence to piggy-back off of. If you’re attempting to fit in dialog that is on the back of the actor’s head, have the actor do their best to match the line to the head movements shown on screen. We’ve all seen scenes where the dialog was replaced but the actor’s head was obviously not speaking the lines, and that can really take you out of the scene. Whenever possible, place added lines on cutaways or wide shots where the actor is obscured. Lastly, ADR is sometimes used to add non-verbal sounds to a film. As I noted above, a sigh, a gasp, or a chuckle can add a layer of meaning to a scene. In the following two clips, you can see Hugh Jackman recording a very intense fight scene. No dialogue, but lots of ADR! While many directors use ADR as a crutch, it’s important to dispel the notion that any original on-set audio can be replaced in post. In my view, ADR is best looked at as a tool for enhancing the emotional impact of your project, and when used properly it can really help sell a scene. But with great power comes great responsibility, and you must be vigilant that each ADR line works within the context of the scene. ADR mixers are some of the many unsung heroes on a film. Because, if we’ve done our job right, no one should ever notice our work. Thank you to Jeff Hinton for contributing this article.